In an effort to expand its presence in the Chinese market, Samsung Electronics hosted its first forum on artificial intelligence in Beijing on Thursday, presenting its newest technology solutions to tech leaders. 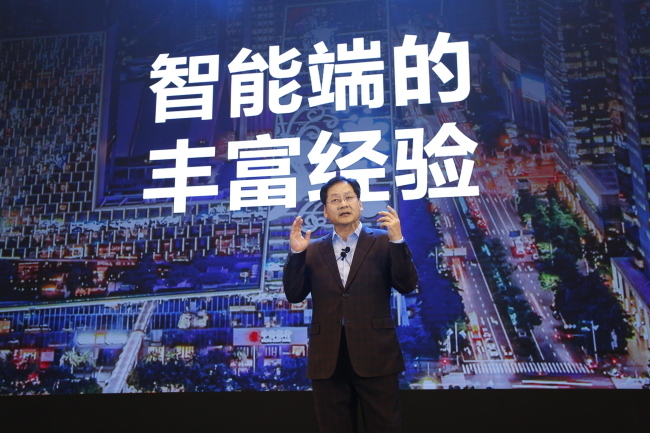 The first such forum by Samsung drew around 500 officials from the country’s leading tech firms, such as Baidu, Xiaomi and Hikvision. Samsung’s choice of venue also drew attention, as China is intensifying competition with the US in attracting and fostering AI startups. Larry Heck, senior vice president and head of artificial intelligence for Samsung Research America, and Chen Tianshi, CEO of Chinese startup Cambricon, presented the latest AI technology trends and forecasts in their keynote speeches. At the forum, Samsung introduced its technology solutions optimized for AI. The company’s memory business presented HBM2 DRAM that aims to boost AI capabilities, and the 256-gigabyite DRAM module for big data and storage systems. It also showcased 16-gigabit GDDR6 graphic DRAM that boasts the world’s fastest processing speed. Samsung’s system LSI business introduced an array of high-spec, low-power mobile application processors and image sensors. The foundry business focused on 7-nanometer process technology using extreme ultraviolet lithography, explaining how the cutting-edge foundry technology can produce chipsets for AI systems on the demand of their Chinese customers. Samsung Display also took part in the forum, where it described the role of displays in the AI era, in which the interface for communication between humans and machines becomes crucial. The display affiliate introduced its organic light-emitting diode technology, saying that its picture quality, response speed and low power consumption would offer optimal solutions for AI applications. Samsung has been holding forums on AI in various countries since last year, inviting renowned scholars around the world. Most recently, the company held a two-day forum in Seoul, where New York University professor Yann LeCun, University of Montreal professor Yoshua Bengio, MIT Media Lab’s professor Cynthia Breazeal and others offered presentations on different aspects of AI technologies. Samsung runs a network of seven Global AI Centers in Seoul, Silicon Valley, New York, Cambridge, Moscow, Toronto and Montreal. Each center is assigned with different sectors of AI technologies under the leadership of Samsung Research based in Seoul.